Whether I'm visiting a new country, city, or town, I always find it fun and interesting visit grocery stores to see the variety of what's available. This past weekend, I was in Tampa visiting family and found some fun finds at the Sweetbay in North Tampa. 1) Goat meat: I purchased two goat chops for $2.50. Since I was also cooking steak, I cooked the goat chops the same way: on a roasting pan in an electric oven set to broil. The flavor was deep, rich, almost gamey, but they were as chewy as old boots. The meat would have been much better served to be slow braised in some cooking liquid for a number of hours. 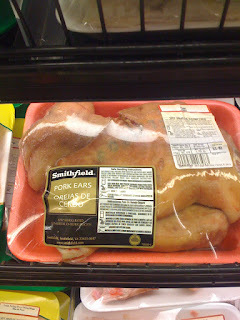 2) Pig Ears and Trotters: I did not buy any pig ears or trotters, but excited by the fact that all parts of the animal were being sold in a grocery store. I made Fergus Henderson's trotter gear a while back and loved the texture of the trotters when they are cooked - really gelatinous. 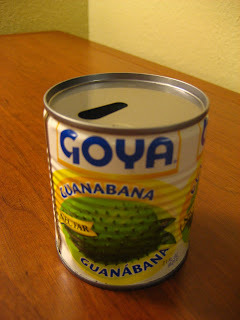 3) Goya Guanabana: also known as soursop or custard apple. This juice is a combination sweet, tart, citrusy, creamy. I mixed it with tonic and it was a tasty, refreshing drink.